These cookies are really insanely delicious. They are a homemade version of Nutter Butters or DoSiDo's.... but better. Imagine that, a homemade cookie that tastes better than a mass-produced out of a box cookie. 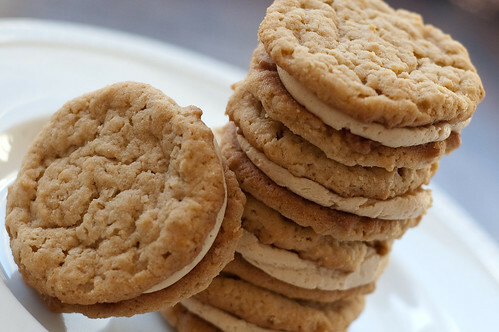 The oatmeal peanut butter cookies are nice and soft, and the peanut butter filling is so good you could eat it straight (umm, not that I did or anything). My daughter goes insane for peanut butter, and loves oatmeal, so its really a shame she's allergic to eggs. This would probably be her favorite thing ever. Preheat the oven to 350. Line 2 baking sheets with parchment paper. Sift together the dry ingredients and set aside. In the bowl of a stand mixer fitted with a paddle attachment, cream the butter, peanut butter, and sugars over medium-high speed until light and fluffy, 2-3 minutes. Add the egg and vanilla, and mix well. Lower the speed to low, and add the dry ingredients, mixing only until just incorporated. Gently stir in the oats with a wooden spoon or spatula. Use a small cookie scoop to portion out the dough (about 2 teaspoons per cookie). Arrange evenly on a baking sheet, and bake 10 minutes, rotating pan halfway through. The cookies should be light golden brown and puffed. Allow to cool on the sheet 5 minutes, then transfer to a wire rack to cool completely. Repeat with remaining dough. To make the filling, cream the butter and peanut butter. Slowly add the sugar, then mix in the heavy cream. Mix until smooth and fluffy. Pair the cookies by size, and spread or pipe filling on one cookie, pressing the second cookie down to spread the filling to the edges. yum!!! i've been meaning to make these but seem to keep forgetting about them. have you thought about using Energ G Egg Replacer when baking? it's what i use when i bake vegan things and you can find it at whole foods. i was a little skeptical about it at first but it really does a good job! Those look fantastic, I can't wait till my daughter can help me make such treats. I have a feeling I would eat enough of these to make up for your daughter's share! PB and oatmeal are some of my favorite things as well! Tara, I haven't tried it yet, but I always look at it when I'm there! I'll have to check it out soon though. This looks like an excellent dessert. Peanut Butter and Oatmeal make a great combination. My favorite Girl Scout cookies! I love oatmeal - I can't wait to give this one a try. I made these last night for a co-worker's birthday. OMG is all I can say. Question, and maybe it's just my ignorance, but can these be left out in an air tight containter? I just wonder with the cream in the filling if they should be refridgerated. Fantastic recipe. 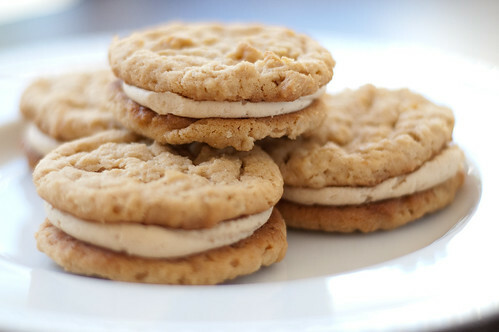 Will make these again - have you tried using chunky PB in the cookies? Hi Chelsa! I actually just sealed them in a plastic bag and left them out. I figured the filling is like buttercream, which I have no problem leaving out overnight. However, they didn't last long enough for it to be an issue anyway! I haven't tried chunky pb, if you do, let me know how they turn out! I wanted to make these when I had but one egg in the refrigerator and it had a function in that night's dinner. I subbed in mayo (about 3 Tbs) and that did the trick. Outstanding cookies! All set to make these cookies. Do you think I can make a double batch and freeze some?